Entertainers of all sorts can be found once again this year at the Delaware County Fair. Musical acts, folks juggling blazing hula hoops, clowns — you’re sure to find something or someone who makes you, or the kid within you, laugh, tap your toe, or sing along. Wednesday’s musical lineup features two shows on the WDLR stage. Central Ohio band Coya Hill brings its southern/alternative/garage rock style to the fairgrounds beginning at 6:30 p.m. The four-man band features Casey Lane and Taylor Wood on vocals and guitar, Ian Campbell keeping the beat on drums, and Nick Vohgelt on bass. Coya Hill rocks the fair right after the hot dog eating contest on Wednesday. Wrapping up the music on Wednesday is the Lucky Penny Sisters. Delaware siblings Leslie Alexander and Caitie Thompson bring their acoustic rock sound to the WDLR stage at 8 p.m.
Modern country band Coal Canyon is the featured act Thursday on the WDLR stage. The four-man group performs at 7 p.m., after all the seeds from the watermelon eating contest are swept up. Based in the Columbus area, Coal Canyon features Wes Brown on vocals and rhythm, Justin Lacher on lead guitar, Charity Detrick on bass guitar, and Tyson Brown on drums. While Coal Canyon is doing its thing, Jon Anthony & the Wishful Drinkin’ Band will be belting out its brand of country, rock, and bluegrass at the motorsports complex. Showtime is 7 p.m. Billed as a “small town appeal with a big town sound,” Jon Anthony & the Wishful Drinkin’ Band has traveled extensively, playing gigs across the U.S. as well as the Caribbean and in Mexico. Band members include lead singer Jon Anthony Fenstermaker and guitarists Dr. Pat Dollenmayer and Dr. Randy Bressler. “Ohio’s Party Rock Cover Band” Cherry Blonde plays the WDLR stage at 7:30 p.m. on Friday. The four-member group covers pop and rock hits from the 1970s through today. The talented, high energy band features powerhouse lead singer Kiersten Bowmer as well as Andy Lautzenheiser on bass and vocals, Nate Salyer on guitar and vocals, and Bill Hutchman on drums and vocals. The WDLR stage will be busy on the final day of the fair with four shows scheduled. Don McCann and Jenna Johnson perform at 10 a.m. Saturday, followed by a talent show from noon to 4 p.m. Acoustic group String Theory plays at 5 p.m. and 6 p.m.
A fireworks show closes out the 2017 Delaware County Fair. It’s planned for 9:30 p.m. on Saturday. 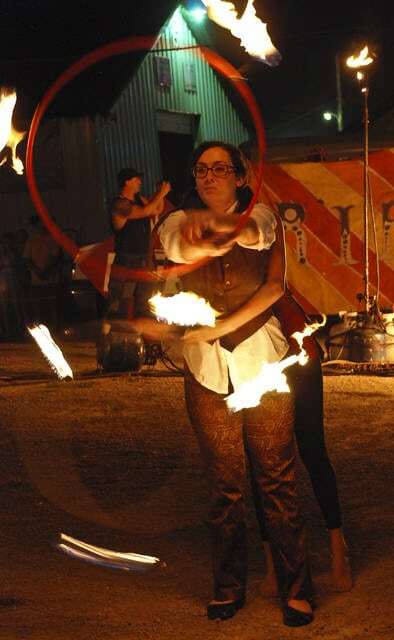 As the evening grew dark Sunday at the Delaware County Fair, a small crowd gathered around near the Buckeye Valley Booster building to watch Rhythmic Illusions Fire Tribe perform with fire. The performer in the photo is actually two. Both performers are twirling and tossing hula hoops around one with one performer hidden behind the other. This entry was tagged delaware county, entertainment, Fair, Festival, music, ohio. Bookmark the permalink.